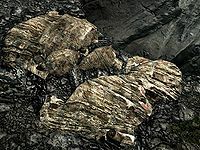 Mining is an activity in Skyrim that involves extracting various ores from veins found in mines. The ore you obtain can be smelted into ingots, and then used to forge new weapons or armor. They can also be sold, which is most profitable if sold to one of the mine owners in the Mine Ore radiant quest. Mining is done by activating an ore vein with a pickaxe in your inventory, or attacking an ore vein with an equipped pickaxe. In addition to standard pickaxes, Rocksplinter or the Notched Pickaxe can be used to mine ore. Ore veins are everywhere: all ore types can be mined from veins and then smelted at a forge to obtain ingots. Veins typically yield three pieces of ore. Each piece of ore has a 10% chance of being accompanied by a random, level-dependent gem, as detailed on the Gems page. After being mined, the vein is depleted, although it will eventually respawn (see bugs). Note that Steel and Dwarven ore do not exist: Dwarven Metal Ingots are obtained by smelting Dwemer metal, and Steel Ingots by smelting one Corundum Ore and one Iron Ore. Categories also exist for each type of vein, e.g. Category:Skyrim-Places-Iron Veins, listing all of their known locations. They are all found under Category:Skyrim-Places-Special Features. To maximize mining efficiency, hold a pickaxe in your right hand and a dagger in your left, use the Elemental Fury shout, then power attack the veins. This allows mining time for a vein to be cut down a few seconds. This same method can also be used to quickly gain extremely large amounts of quarried stone and clay. Another method of increasing mining speed if you don't have Elemental Fury is to get the Dual Flurry perk, hold a dagger in your left hand, and use normal attacks on the veins. Every vein contains three ore, and all three will be added to your inventory if you mine long enough, but you will not receive a notification on your screen when the second one is extracted. The Dragonborn add-on adds several gem geodes to various locations on Solstheim. Mining them will yield a single gem. A graphical glitch can occur when you start to mine any type of ore vein, causing you to clip through it, interrupting your mining. Possible solutions: sleeping, uninstalling/reinstalling the game from your console, avoiding the mine where the glitch first occurred, or killing all enemies in the surrounding area before mining the ore. It is still possible to manually mine the ore vein (attacking the vein with an equipped pickaxe) if this occurs. You may be unable to mine ore veins after they respawn. Leaving and reentering the mine or the cell will enable the veins, allowing you to mine them normally. If manually mining while dual-wielding, the game only checks for a pickaxe in your right hand, and counts two swings per attack if you have one. Dual-wielding a pickaxe with a dagger in your left hand greatly accelerates the mining process. Conversely, dual-wielding a pickaxe in your left hand doesn't let you manually mine if you don't have one in your right hand. If you activate an ore vein while wielding your only pickaxe, you'll sheath it visibly on your hip, and then start mining with a second "phantom" pickaxe. Mining may give two firewood every time it gives ore. This happens at all veins and the cause is unknown. Attacking an ore vein with a pickaxe may result in the pickaxe not hitting anything, forcing you to mine manually by activating the vein. This tends to happen with veins set flat against the ground or a wall. When activating a vein, you may end up swinging at it indefinitely without gaining ore or depleting the vein. Use the movement controls to break free of the animation, and then try again. This page was last modified on 18 September 2018, at 21:21.